P.J.Traill: I believe the following to describe the way in which the term is intended; it would be helpful if Bill, who used and perhaps introduced it, could verify this description. A rogue ko is a ko with options to play it in various ways which would place it in more than one of the traditional categories such as direct, approach, multi-stage, etc. In that sense, perhaps a thousand-year ko should also be regarded as a rogue ko, though it also offers the choice of seki instead of ko. The choice between the options for playing a rogue ko will be made on the basis of the ko threat situation, making it a hyperactive position. They are discussed in Computers and Games III, but not explicitly defined there. 2-move approach rogue ko, 1–9. W2: threat; W4–W8: ''see text''. 2-move approach rogue ko, 9-15. 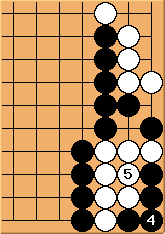 This example comes from Tsumego from games 20. 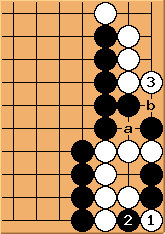 Black will usually prefer to make a bent four shape in the corner rather than play the approach move outside (a), because it allows him to take the second ko first. Here White’s local ko threat (b) makes the approach move better, as a rule. To prevent Black from making bent four, throws in to make a ko. White can play to set up a local ko threat for the direct ko. This is the usual continuation for this kind of throw-in ko in the corner. makes the bent four shape and takes. Because of White’s local threat, Black’s sacrifice does not give him the advantage of taking ko first in the second stage. Black gains more in the corner by eliminating White’s ko threat with this , which is also an approach move. This saves 1 point locally, no matter who wins the ko. Black should therefore only sacrifice at when he can gain enough from the aji at a to compensate for both the 1 point loss in the corner and having to make the first threat. (P.J.Traill: If the definition above is right:) This choice between playing it as a direct or an approach makes it a rogue ko. This is Fig 11 in Bill’s paper. Black can throw in at a (e.g. when ignoring a ko threat) to raise the temperature or win the ko by connecting at b. When White is leading, however, her only worthwhile option (apart from answering a threat) is to connect the ko. 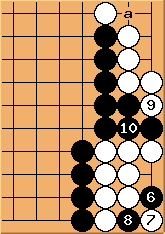 2-move approach rogue ko, 1–9. : threat; – : see text. This is Fig 12 in Bill’s paper. After 15 finishes the ko, a ⅓-point ko remains at a.
has made 2 threats ( , ) which has answered and has ignored 3 threats ( , , ). Other options for both players are discussed in Bill’s paper. P.J.Traill: Before 2018-12-22, this page asserted that they are mentioned in Mathematical Go, but I cannot find them in (my edition of) Mathematical Go Endgames; I did find them in Bill Spight’s paper Evaluating Kos in a Neutral Threat Environment: Preliminary Results in Computers and Games: Third International Conference. The discussion of rogue kos in that paper may be found at Google Books – although Google Books does not provide page 425, page 426–427 are perhaps all there is on the topic, again without an explicit definition. There he discusses examples 2 and 3 above and evaluates their counts under various assumptions.